Best friends forever, from left Jodie Dolansky and Scarlett Kulp, inspiration for the Hometown Heroes celebration take time to smile for the camera. 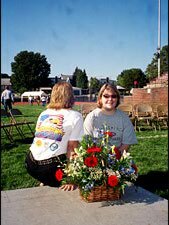 Zuber Realty agent Connie Dolansky (left) and Janet Kulp, co-coordinator of Hometown Heroes 2006 work together to prepare for the event. 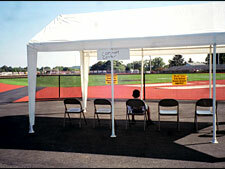 Rodney Kulp Junior previews the comfort at the Comfort Tent during set up preparations. G.I. 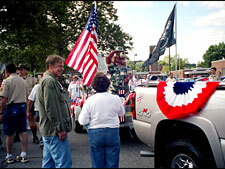 Joe salutes his hometown during the parade; the float was created by hometown heroes John Leffel and friends. Bear Fever Papa Bear and Viet Nam veteran airman Paul Stahl chats with proud Mayor Marianne Deery on their first sighting of G.I. 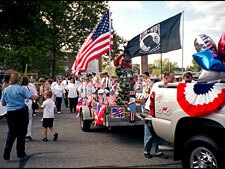 Joe on parade. 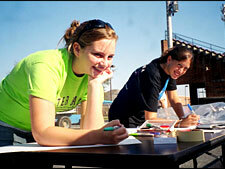 Pitching in to help with set up are (from left front) Melinda Leff and co-coordinator Janet Kulp. In the back row from left Zuber Insurance agent Mike Zwolak, and committee members Karen McNear, and Lions Club member Rick Frey. 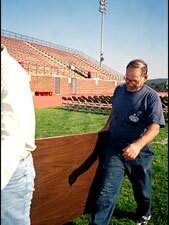 Super dad John Leffel lends his muscle to the committee during organization and during the morning's set up preparations in any way he can. 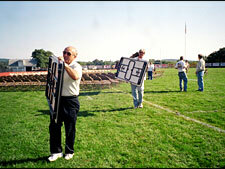 Lions Club member Karl Stauffer and Rodney Kulp lead the march of tables to designated locations during set up. Melinda Leffel and Karen McNear show the Hometown Heroes t-shirts and flowers to be presented to Scarlett Kulp as inspiration for G.I. 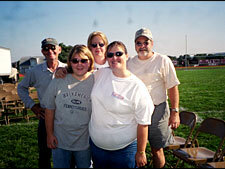 Joe, the permanent memorial and Travis Zimmerman Memorial Fund. The Boyertown Exchange Club build a Healing Field for Hometown Heroes event, another community organization inspired by Scarlett's original efforts to secure a Bear Fever bear to honor her friend and neighbor Travis Zimmerman. NEW BERLINVILLE—One evening in April, the Kulp family saw Army cars parked across the street from their neighbors’ home in New Berlinville. They dreaded the purpose of the visit. Their fears were confirmed when they learned the news a short time later that their long-time neighbors’ son, 19-year-old Travis Zimmerman, was killed by a roadside bomb in Iraq while serving in the Army. Scarlett Kulp grew up alongside of Travis. The longtime friend didn’t want people to forget about Travis or the commitment he made to serve his country. She mentioned one evening during dinner to her mother about making a military bear in memory of Travis and in honor all people who serve in the military. Janet Kulp took the idea to Jane and Paul Stahl, originators of the Bear Fever Community Art Project. 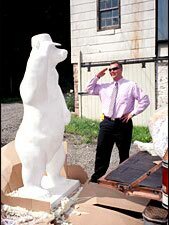 Together, they brainstormed about having Cowpainters Inc., the company that provides the fiberglass bear molds, create a special, one-of-a-kind bear that would stand in a saluting position and wearing a military hat. The concept for the Pfc. 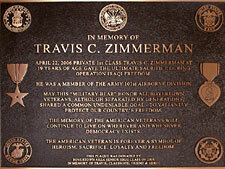 Travis Zimmerman Memorial Fund was born. 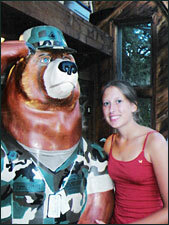 Scarlett, an 11th grade student at Boyertown at the time, was on a mission to raise $2700 for the custom-designed bear. With the help of her brother Rodney Jr., her parents, her Aunt Melinda Leffel and friends, she placed collection containers throughout the community. She set up a table at the annual Sidewalk Expo, asking for donations. Students at Washington Elementary School raised more than $1,200 for the cause. The students donated 50 cents each and wore red, white and blue to demonstrate their support. At Colebrookdale Elementary School—the school Travis attended from kindergarten through sixth grade—the teachers and staff held a “Hats off to Travis Day.” Students donated their pocket change and wore their favorite hats to school, and during a special tribute, they took off their hats in Zimmerman’s honor. They raised more than $700. The students and staff at Boyertown Junior High West and the senior high schools held their tributes and made donations. The fundraising spread throughout the community. Area businesses and fire companies had collection containers. To Scarlett’s amazement, they raised most of the money within a few months. “This is a great community,” Leffel said. “We received donations of $5 to $500. By Memorial Day weekend, the Kulps had enough funds to order the bear, and with the help of the Stahls, Zuber Realty, and the Boyertown Area Community Foundation, they started the Pfc. 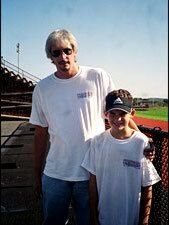 Travis Zimmerman Memorial Fund. The perpetual fund, beyond providing for the cost and future maintenance of the permanent memorial, will help area military personnel as they readjust to civilian life upon their return from service overseas. 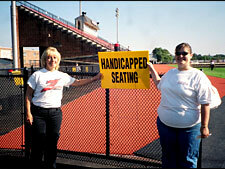 The Stahls fondly refer to the fund as Boyertown’s G.I. bill. The idea that originated during a conversation at the dinner table grew into a community endeavor that has spread beyond the borders of the state. Artist Kylene Bertoia-Hart, the artist who volunteered to paint the military bear, finished her work last week. The six-foot bear will make its debut during the Hometown Heroes parade and ceremony slated for Sunday, September 17. 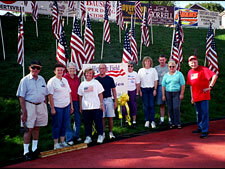 The Kulp family and Leffel are playing a significant role in organizing and coordinating the parade, ceremony and speakers. They and the other volunteer organizers invite the community to share in the festivities to honor the military, veterans, police, firefighters and all first responders in the wake of the five-year anniversary of the terrorist attacks of September 11, 2001. Scarlett, who plays a trumpet in the Boyertown Area Senior High band, will proudly be marching and playing in the Hometown Heroes event. Slightly north of Bally in the midst of acres of cornfields, a gravel road leads to the home of artist Kylene Bertoia-Hart. A split-rail fence separates the yard of her farmhouse with an adjacent golden-flecked field where wildflowers grow. During the past few weeks, though, Bertoia-Hart has not had much spare time to enjoy the late summer beauty of this bucolic scene. Inside her studio, with its wooden beams and rustic stone walls, she is fervently painting a six-foot-tall fiberglass bear, the next statue of the Bear Fever Community Art Project. Bertoia-Hart’s objective is to create a memorial to Pfc. Travis Zimmerman, a 19-year-old New Berlinville resident who died on April 22 in Baghdad. 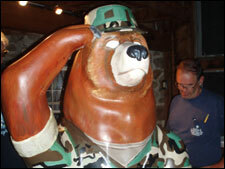 The bear will also serve as a lasting tribute to all military personnel and veterans. Following Zimmerman’s death, Boyertown high school student and neighbor Scarlett Kulp and her brother Rodney started collecting funds for the bear project. With the community’s overwhelming response and support, the Kulps raised enough money within a few months to order the custom-made bear, which stands at attention saluting all past and present military persons. Bertoia-Hart learned about the project from Boyertown High School art teacher Linda Austerberry-Rohrbach, one of Travis’ teachers. She immediately volunteered for the project. “I can understand how they feel. 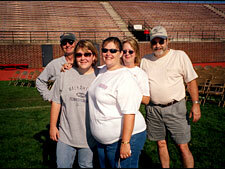 I lost my only child Kyndi at the age of 21 on January 12, 2001, due to an undetected hear defect,” Bertoia-Hart said. Art, and painting in particular, helped her cope with the devastating loss. “My friend, Marian Rowland, a counselor, told me to start painting,” she said. Her sister, Joanne Lantzy Plum, a professional artist, took Bertoia-Hart under her tutelage, and together they worked on landscapes and portraits. “We both painted when we were younger,” Bertoia-Hart said. Following college, her sister pursued a career in art. Her work regularly appears in galleries from Allentown to Philadelphia and in several local art shows. Additionally, she instructs students and adults of all ages at her Pennsburg studio. Bertoia-Hart’s life followed a different path from her sibling’s, as she pursued her undergraduate degree in human services at Antioch University and her master’s degree at Villanova University in liberal arts studies including art, literature, philosophy, counseling and psychology. Bertoia-Hart has been a professional, full-time massage therapist for 25 years. She practices shiatsu, reiki, deep muscle massage, sport and aromatherapies. With her renewed art passion, she regularly paints several times a week at her sister’s studio and has reached a point of healing. “It is relaxing to paint,” Bertoia-Hart said as she refines the bear’s fur using an array of brushes. Bertoia-Hart, following the instructions of the manufacturer, Cowpainters LLC, mixes the acrylics with a polymer medium to enhance the colors and provide a sheen to the finish. She researched how to use and apply an epoxy putty called Magic-Sculp to create the cuffs on the rolled-up shirtsleeves and the identification tags and chain around the bear’s neck. Using aluminum foil, she molded the shapes and then applied the putty and paint to create a realistic effect. By layering paints, she creates the olive-tan-brown pattern of the camouflage military fatigues. Shawn Haviland’s loaned uniform hangs on a model as a guide. Haviland formerly served in the armed forces and has been active in the fund-raising efforts for the bear and memorial fund. Bertoia-Hart said she learned color techniques studying with N.C. Wyeth’s grandson, Sean Wyeth. She met him through her massage therapy work, and they decided to barter services. Wyeth, who has studied with famous portrait artist Nelson Shanks, shared his oil and watercolor paint techniques. Bertoia-Hart’s paintings feature landscapes and still lifes. Her commissioned work started when she was painting landscapes in England, the native country of her husband, Dr. Stan Hart, and has continued to steadily grow by word-of-mouth advertising. Her present goal, however, is the completion of the military bear by August 31. 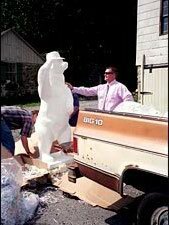 “A clear coating will be applied to the bear, like the others, and then it will be unveiled on September 17 during the Hometown Heroes celebration,” she said. The dedicated artist has even postponed her honeymoon—an Alaskan cruise—to complete the bear.